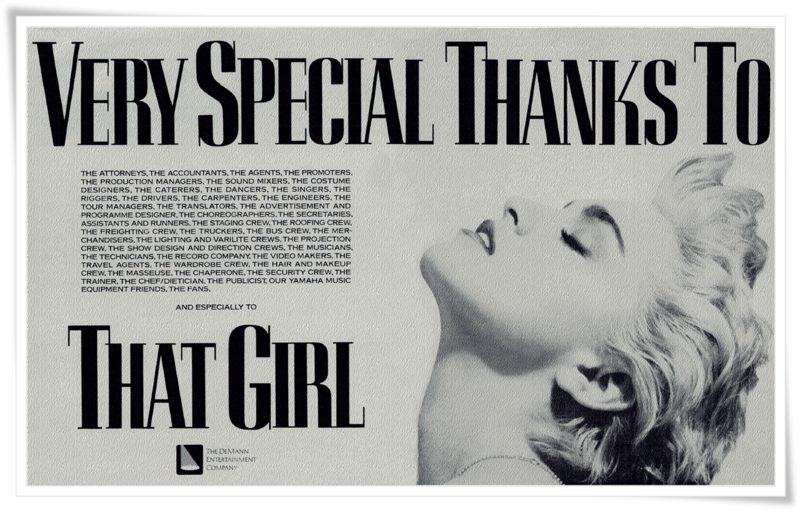 On October 17 1987, Billboard magazine featured a two-page spread taken out by Madonna’s manager, Freddy DeMann, thanking everyone involved with Madonna’s massively successful Who’s That Girl World Tour, which had wrapped up in Europe the month before. 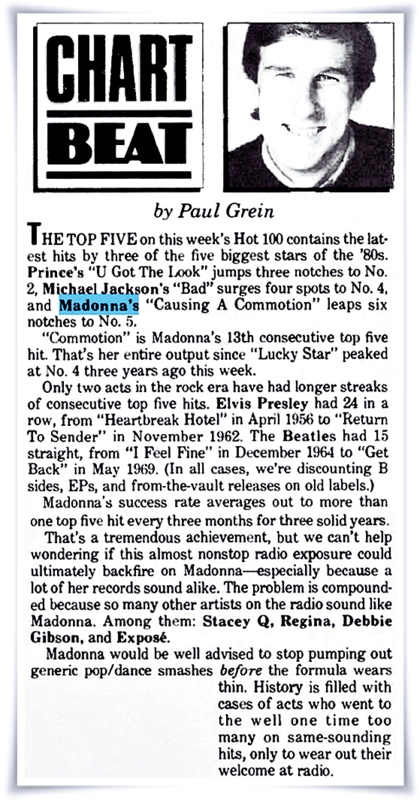 In the same issue of Billboard, Chart Beat columnist Paul Grein marked Madonna’s 13th consecutive top-5 hit as Causing A Commotion moved into the #5 position on the Hot 100. Speculating on how long Madonna’s winning streak could last, he warned of the dangers of over-exposure and artistic complacency. Without the benefit of hindsight, the back-handed compliment and slightly patronizing advice is not altogether unreasonable, and is certainly not unusual for the time. Less reasonable, however, is his summation that the severity of Madonna’s potential fall from grace would be compounded by the abundance of female singers of the era who “sound like Madonna”. Because you know, all female singers are only that – female singers. Even though you’re co-writing and co-producing your own songs and radio can’t get enough, neither can your audience or even your peers, you’re breaking records set by top male and female artists alike, you’re selling out stadiums around the world and earning high praise as a live performer – don’t think any of these things should afford you any respect. You may not have entered the business through the back door and you may have paid your dues and then some, but you’ve still just been lucky, that’s all. You couldn’t possibly possess the talent or the drive to evolve or the insight to be able to stay in the game once your luck runs out. Even though you are the one that everyone is copying – you’re still just another female singer, and they’re a dime a dozen. While we no longer need hindsight to spot the glaring absurdity and blatant sexism of such an argument today, would it be as obvious if Madonna hadn’t stuck around to dispel it? On January 4 1991, Madonna responded to a Rabbi’s accusation of anti-semitism for the song lyrics in the remix of Justify My Love, called The Beast Within. In a letter sent to Madonna’s manager, Freddy DeMann, Rabbi Cooper said the Wiesenthal Center was outraged and wanted the quotation withdrawn. “The imagery of ‘Jew as Devil’ has led to untold violence against the Jewish people and slander against Judaism over the course of the last 2,000 years,” the rabbi wrote. He charged that the phrase could “contribute to those who seek to promote anti-Semitism” and said that neo-Nazi groups had used such imagery to promote racist ideology among youth. Rabbi Cooper said he took Madonna at her word. “She was direct to the issue, she responded quickly and we’re relieved that she did so,” the rabbi said. How did you feel about The Beast Within the first time you heard it? 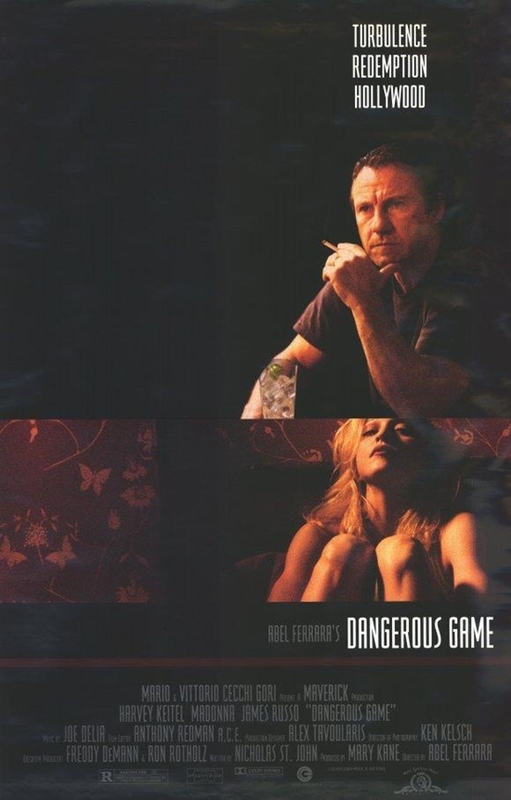 On October 15 1998, an article by Chuck Philips ran in the LA Times regarding a dispute between the principal shareholders of Maverick Records – Freddy DeMann, Guy Oseary and Madonna. A feud between the founders of Madonna’s Maverick Records, one of the most successful start-up labels of the decade, is threatening to undercut the label’s value if it goes up for sale next year. Sources said Maverick co-Chairman Freddy DeMann might leave the company before January with a buyout package worth more than $20 million. Representatives for Madonna, DeMann and Maverick minority owner Guy Oseary have been meeting regularly in Burbank to resolve the matter with senior brass at Time Warner’s Warner Music Group, which owns 50% of Maverick. None of the principals involved in the discussions would comment, but sources said Madonna and Oseary have wanted DeMann to leave for more than a year and have asked Warner to underwrite his exit. The disagreement is likely to undercut the trio’s bargaining power when its joint-venture deal with Warner runs out in July. Maverick could command as much as $200 million on the open market if Warner chooses not to exercise its option to buy the company next year, sources said. The label has generated more than $750 million in revenue since 1992 selling music by such acts as Alanis Morissette, Prodigy and Candlebox. Discord among Maverick’s principals, however, has hampered the trio’s ability to attract suitors and has given Warner the upper hand in the negotiations, sources said. Indeed, one proposal on the table calls for Warner to put up the money to finance DeMann’s exit and possibly give Madonna and Oseary a higher stake in the label in exchange for a commitment from them to extend their joint venture with Warner for five to seven years, sources said. The size of DeMann’s exit package will depend on what value the parties assign Maverick, sources said. 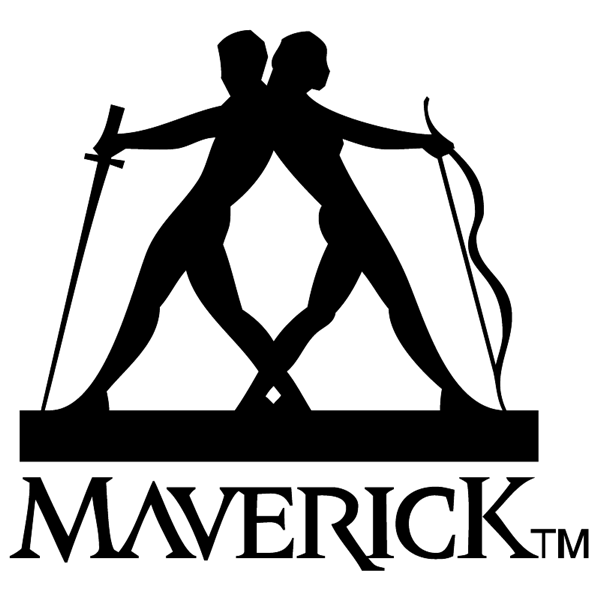 DeMann is likely to walk away with at least $20 million to cover his 20% stake in Maverick but could be paid twice that amount before the talks conclude, sources said. DeMann is being represented in the negotiations by financier Jerry Perenchio, a longtime friend. One source said the 59-year-old DeMann is upset because he wants to sell Maverick in July and cash out, but Oseary and Madonna prefer to negotiate for a bigger stake in the company, with plans to sell in six years. Other sources, however, said DeMann is being forced out by Madonna and Oseary–who, until recently, have relied on his expertise to navigate their careers, as well as manage the record label now at the center of the dispute. Madonna and DeMann launched Maverick in 1992 as a joint venture with Warner, which put up about $10 million to finance the partnership. Initially, the company was viewed as little more than a vanity label–a bargaining chip used by Warner to sweeten its offer during contract renegotiations with Madonna, who is signed to the company as a recording artist. DeMann had pitched the label concept to Madonna, whose career he had managed since her arrival on the pop music scene in the early 1980s. He then built the label from scratch, hired its staff and even came up with the company’s name–a combination of letters culled from Madonna, Veronica (the singer’s middle name) and Frederick (his first name). One of DeMann’s first hires at Maverick was Oseary, a 19-year-old with virtually no experience in the music business who was a friend of DeMann’s daughter. DeMann took Oseary under his wing and gave him a job as Maverick’s artist and repertoire man, the employee responsible for discovering musical talent. 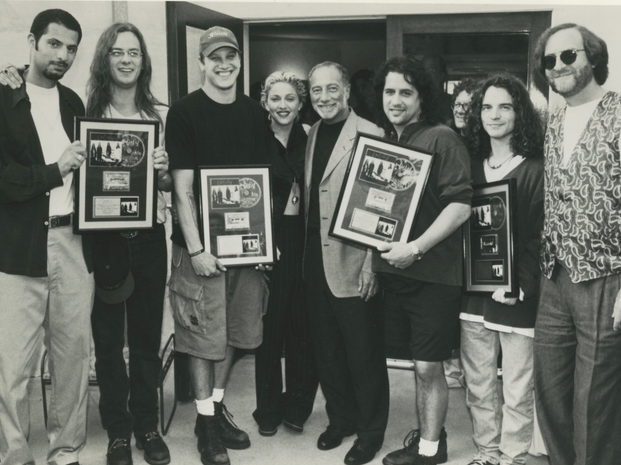 Oseary delivered his first hit in 1993 with the Seattle rock act Candlebox, whose debut album sold 4 million copies. Oseary then came across a tape of Morissette, an unknown Canadian singer whose demo had been rejected by every major record company. He liked what he heard and played it for DeMann, who agreed to sign her to Maverick. The album eventually sold more than 28 million copies worldwide. Following Morissette’s success, Oseary’s profile rose dramatically. The young executive was rewarded with a minority stake in Maverick and tensions soon began to mount within the company, sources said. In 1996, Madonna dumped DeMann as her manager and ultimately hired Q-Prime’s Cliff Bernstein and Peter Mench to represent her. A friend of Oseary’s is said to have helped facilitate the singer’s move to Q-Prime, sources said. Within a year, representatives for Madonna and Oseary began to lobby Warner for help in financing an exit package for DeMann, sources said. Warner turned the request down last October but resumed discussions with representatives for the trio a few months ago after rumors surfaced that Sony Music might be interested in acquiring Maverick or hiring Oseary and Madonna next year to start a new label, sources said. It is unclear why Madonna, Oseary and DeMann couldn’t maintain a united front until after their Warner deal runs out in July. The dispute, however, appears to be heating up as Maverick prepares for the Nov. 3 release of Morissette’s follow-up album, one of the most widely anticipated projects of the year. During the last few weeks, executives from Warner have held meetings with Madonna’s attorney Allen Grubman, Oseary’s lawyer John Branca and DeMann’s representatives Perenchio and attorney Larry Kartiganer. While nothing has been decided, sources said the matter is expected to be resolved by the end of the year and possibly even before Morissette’s album hits the street. On October 13 1983, Madonna performed Burning Up, Everybody and Holiday at Camden Palace’s Thursday Party Night in London, England. This could be the way pop promotion is going – new artists launched not with a full concert, but with the live equivalent of a video clip. Pioneered by the likes of Grace Jones, this is a cut-price promotion device in which a disco artist suddenly appears for half an hour, singing live to backing tapes. This demonstration was by a white girl in her early twenties, known simply as Madonna, a dancer who moved to New York from the Mid-West as an ambitious teenager and is currently the most important new figure in the American dance scene. She succeeded partly because she makes great records and partly because she has turned the boring idea of a track date into an exotic event. Dressed in holocaust chic – black top, black skirt and leggings, lots of bare midriff, and hair in ringlets – she sang well, with a husky, black-sounding voice, and danced even better. She hurtled around the stage, mostly swivelling her hips like a belly-dancer while performing her songs like Lucky Star and the stirring Holiday. Given a full set and a live band behind her, Madonna would seem to have the makings of a major star, so it’s no wonder she is now being managed by the man who guided Michael Jackson’s recent career. On October 12 1991, Madonna and Freddy DeMann attended the wedding of entertainment attorney Allen Grubman and real estate broker Deborah Haimoff. The wedding was held at the New York Public Library. Other guests included Robert De Niro, David Geffen and Mariah Carey.